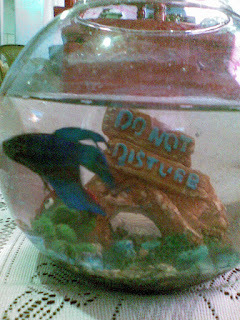 My pet fish enjoys its 6th monthsary today in its little habitat. Do you recall the name of this fish? It is a killer fish. It can not live with another fish in the same habitat because it kills even its own race. Glad that this fish never grows big. That is why, in its habitat it poses a warning, DO NOT DISTURB signage. I promisse don't disturb your fish. You makes me happy with your visit. Hi Imelda, I think it's called Beta fish here in the US.